So much of kids’ play revolves around taking control of space and reimagining it as something else. Children tend to love hidden spaces they can make into dens, vehicles and magical machines: whether that space is a secret hollow in a tree trunk, the cupboard under the stairs or even an utterly everyday cardboard box. Left to their own devices, most children will be able to find plenty of appropriate places for this kind of play. But fortunately there are a fair few toy designers out there too who perfectly understand a child’s need to create their own imaginative spaces, and have created some brilliant items to make creative play come that little bit more easily. Some of the toys featured here are simple but inspired while some are so cool you’ll wish you could go back in time and experience them as a child yourself. All, however, are fantastic aids to play that succeed remarkably well in making the everyday into the extraordinary. Take a look. 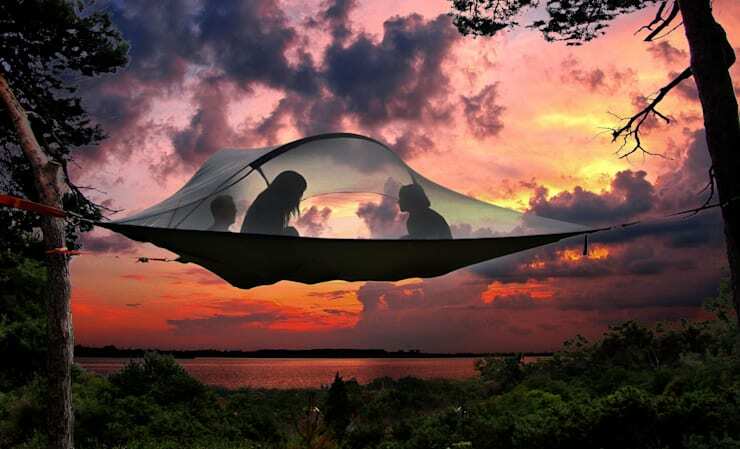 This airborne tent is so incredibly awesome that there are few adults who could resist the urge to get into it. Imagine, then, how children are likely to respond. If you had had a place to hang out when you were little, would you ever have wanted to be anywhere else? It’s the perfect hideaway for secret clubs and storytelling, and on warm summer nights – wrapped up in sufficient layers, of course – it could also be the ideal spot for drifting off to sleep. In many ways this design harnesses much of the same appeal as a tree house: it’s a private space up in the air at a safe distance from the dull concerns of daily life below. Unlike a tree house, however, you don’t have to be good with a hammer and nails to give this to your children. 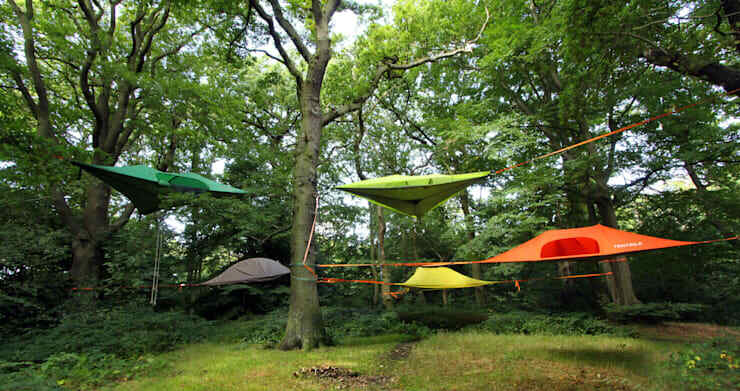 If you have the space, creating a levitating campsite like this one is a surefire way to give your kids’ social lives a boost, since all their neighbourhood peers will suddenly become a lot more eager to spend time in their garden. As this picture shows, there’s also a lot to be said for the aesthetic element of this option; and with a host of different colours available you can mix and match to complement your outdoor area perfectly. 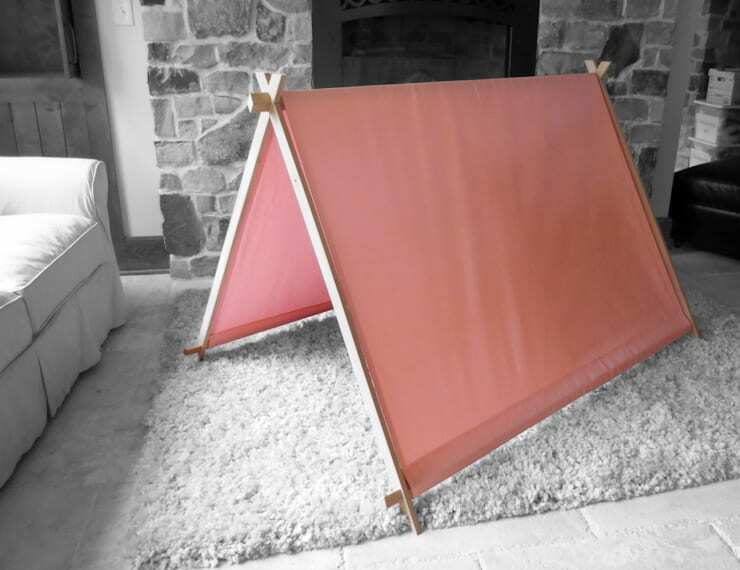 This cute little indoor tent might be a little less thrilling than the ones we just looked at, but for a toddler who isn’t quite ready for liftoff yet this is a pretty good alternative. Children will feel completely hidden having tea parties and organising lessons for their toys inside this space where adults can’t fit, but in reality it’s a very easy place for you to keep an eye on them. ​When is a bed not a bed? When it’s a tree house, of course. This pretty design is a great option for incorporating an extra play area into your kids’ room. There’s just one thing to watch out for, however: whoever gets the bottom bunk is definitely going to get jealous. A rota system may have to be organised. 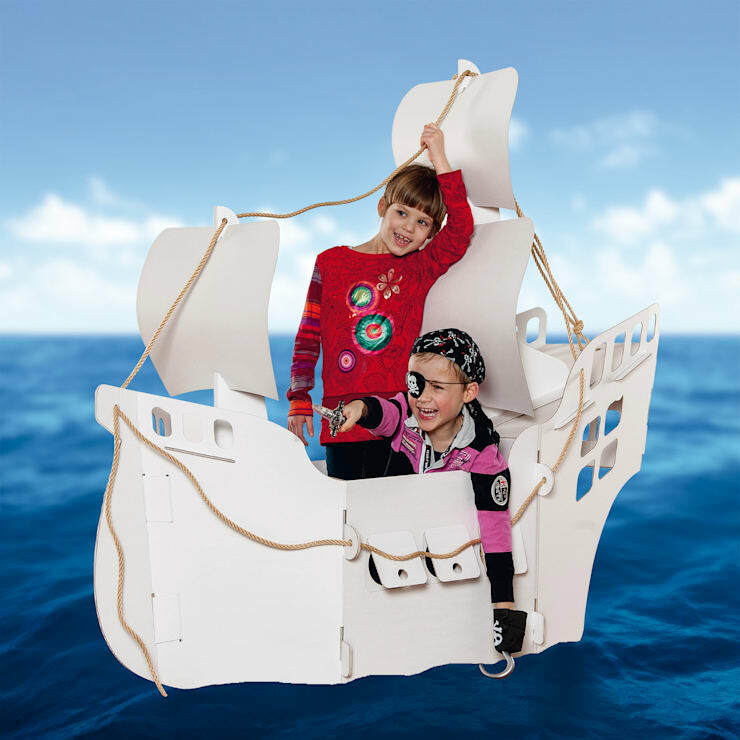 Your kids can sail away to exotic shores whenever they feel like it with this easy to construct, easy to fold away cardboard pirate ship. The children in the photo appear to have resisted the urge somehow, but the white surfaces seem to beg for a little personalised decoration, which would make for a very fun afternoon activity when your little buccaneers aren’t too busy searching for treasure. Which of these toys would your children go crazy for?